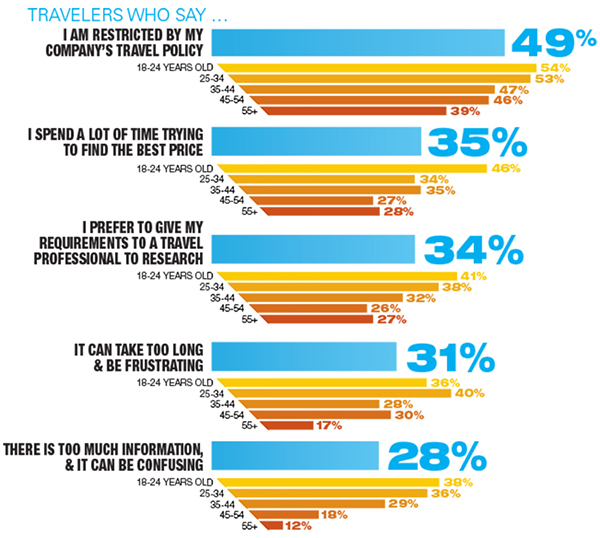 About half of business travelers feel restricted by their travel policies, according to a survey by Travelport. In that statistic, Travelport general manager and VP of U.S. sales Erika Moore sees an opportunity for travel management companies and corporate travel managers to manage a bit more, especially when it comes to lightly managed travelers. Moore said travelers, both business and leisure, want to personalize their trips, and corporate booking tools and add-on technologies now allow travel managers and TMCs to offer more guidanceâ€”say, on pricingâ€”and more flexibility for travelers researching and booking business trips. The policy that a corporate travel manager writes into the corporate booking tool, for example, could remain strict about the type of hotel a traveler can use but be flexible about the return date at the end of a trip. That would allow the traveler freedom to tack on leisure travel while a gamification tool could capture the savings if the traveler instead opted to return on a cheaper flight immediately after business is done. Newer technology also allows companies to tailor the policies in booking tools to particular groups, such as road warriors, Moore said. Below are more results from Travelportâ€™s survey, conducted from Aug. 4 to 16, 2017, of about 1,000 U.S. residents who traveled at least once for business in the previous year. Note that respondents answered the questions with business and leisure travel in mind at the same time. However, the information revealed applies to corporate travel, considering todayâ€™s focus on traveler satisfaction. Copyright 2018 Northstar Travel Media, LLC. All rights reserved. From http://www.businesstravelnews.com. By Amanda Metcalf.